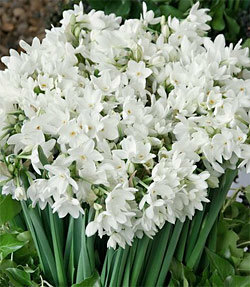 Botanical Name: Narcissus papyraceus Description: Paperwhites are well-known for their easy care and profuse blooms. They're highly fragrant and wonderful for livening up the indoors in the dead of winter. In just 4 to 6 weeks you'll enjoy a delightfully scented indoor garden! Grows 16-20 inches tall. Produces 9-14 florets on 1-3 stems.